Are you looking forward to the big holiday of the summer? It’s a time for fun, friends, family and of course – food! 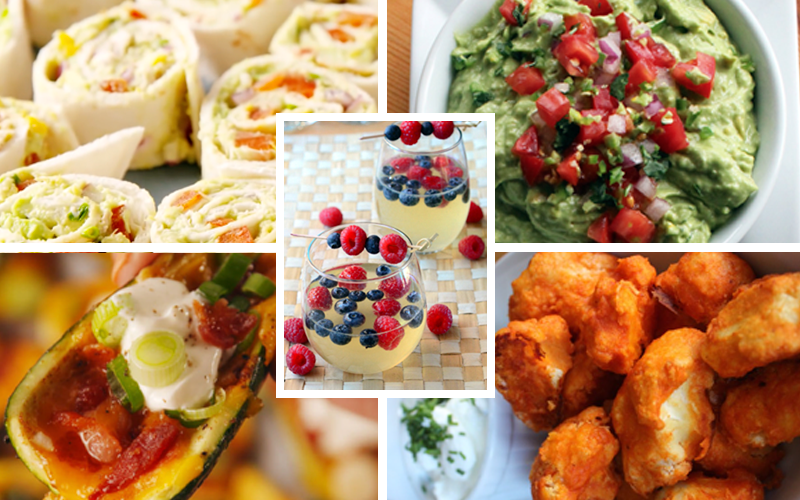 Here’s a list of some of the tastiest party recipes that are both delicious and healthier alternatives. This dish puts a healthy twist on classic Buffalo wings by replacing chicken with cauliflower – which is high in Vitamin C so it boosts immunity and works as an effective antioxidant. Try Pop Sugar’s recipe, they recommend dipping the wings in your favorite hot sauce for an additional kick and boost of Vitamin C! Antioxidants found in zucchini have been found to exhibit powerful anti-aging properties. They also protect your body and skin from free radical damage. An alternative to a loaded potato skin – your party guests will thank you! Try this quick and easy recipe from Delish, and for an even lighter dish, substitute regular bacon with turkey bacon. You’ll find chips and dip at any party, but this small snack can be heavy on calories and loaded with oils. Sweet potato chips are the perfect substitute! Sweet potatoes contain over 400% of your daily needs for Vitamin A in just one spud. Vitamin A has the power to reduce wrinkles and increase blood flow to the surface of the skin. Guacamole is a staple snack for any party – and for the most part, it’s good for you too! It contains all natural ingredients and the main ingredient, avocado, contains Vitamin C and Vitamin E, which prevents wrinkles and anti-aging. However, too much avocado in one sitting can pack on the calories. PopSugar’s recipe suggests substituting some of the avocado with low-fat Greek yogurt. The dish will be fluffier and will also contain a variety of vitamins and extra protein. These roll ups can serve as a light lunch or a tasty party appetizer. Packed with ingredients like chicken, avocado and bell pepper, this snack is both delicious and nutritious. The recipe calls specifically for red bell peppers, which contain powerful antioxidants and Vitamin C to help form collagen and keep your skin healthy. For an extra healthy supplement, switch your flour tortilla with lettuce to wrap these delicious salad roll ups. End your Fourth of July with a bang with this fun, festive cocktail. This recipe blends white wine and triple sec with a mix of berries to get in the red, white and blue spirit! Strawberries and blueberries both contain high levels of Vitamin C and serve as a great source of fiber.